Nudibranchs are commonly known as sea slugs, although they are not closely related to their terrestrial name-sake. They do, however share some physiological traits, leading to them sharing a name: notably they both generally lack the hard shell which is commonly associated with molluscs. The word ‘nudibranch’ literally means ‘naked gill’, being made up of the Latin word, ‘nudus’ (naked) and the Greek word, ‘branchia’ (gill) - referring to their having no protective cover on their gills. 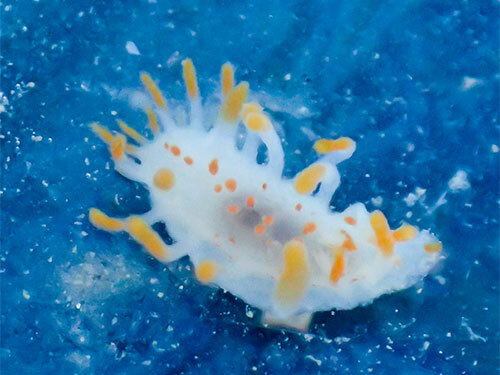 Nudibranchs can be found all over the world, mostly in shallow waters. This means that if you look closely enough you may even find them in a rock pool. Here in Sussex, we occasionally find them on our Shoresearch intertidal surveys, which is always a real treat! These creatures come in a huge variety of colours and forms. Most commonly on Sussex shores, we spot Sea Lemons, Archidoris pseudoargus, and Grey Sea Slugs, Aeolidia papillosa. 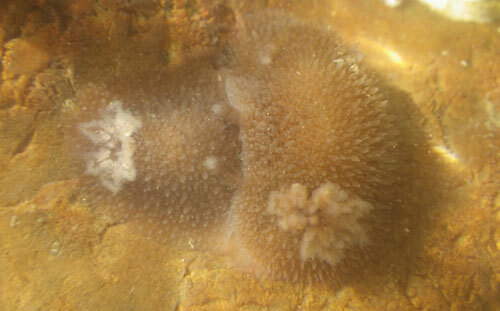 However other recent finds include the Orange-clubbed Sea Slug, Limacia clavigera, and Facelina bostoniensis. Aeolid species such as the Grey Sea Slug have cerata, which are the long projections extending from the mantle. These are used to store stinging cells which the nudibranch obtains through eating cnidarian prey, such as anemones and hydroids. These stinging cells will be discharged into the face of predators if they are threatened - a form of defence which more than makes up for their lack of protective shells! On the shore, we don’t always see nudibranchs in the flesh, but will find a clue that they are nearby: their eggs. 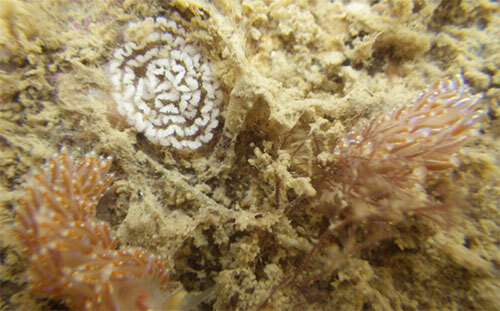 Nudibranch eggs vary in colour and form, from coiled flat ribbons to tiny, delicate little pearls. Nudibranchs are hermaphrodites, possessing both male and female reproductive organs; however they cannot self-fertilise so a pair is required to reproduce. When they mate, double copulation often occurs, meaning that both individuals donate and receive sperm. This reproductive tactic is advantageous as a nudibranch can encounter any mature individual of the same species and they will be a potential mate! 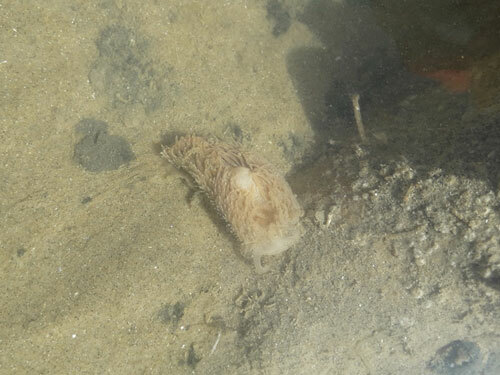 Spring and summer is a great time of year to look for nudibranchs and their eggs; the next time you’re out rock pooling do keep an eye out for these fascinating creatures! And, if you’re lucky enough to find one please send an email to sarahward@sussexwt.org.uk with the details of where and when you found it (ideally with a photo too).